This article explains how to extend Spring-LDAP with an iBATIS-style XML Data Mapper to access LDAP data through intuitive JavaBean operations. First, it requires writing Java code to implement the mappings between JavaBean object and LDAP entry. This leads to the unpleasant situation of tight coupling between your Java application and LDAP schema. Furthermore, it lacks an easy way to manipulate an LDAP hierarchical sub-tree (LDAP entry and its children) with a single JavaBean object. Let’s start with an example data model of a company named “Krusty Krab”. Figure1 illustrates the data structure: the company with various departments, each with various employees. Figure 2 shows the hierarchical LDAP entries. To manipulate the data in LDAP (in Figure2) as JavaBeans (in Figure1), you have to do the followings according to a standard approach of Spring-LDAP. Step1: Design the object model as JavaBeans. Step2: Design the AttributeMapper and/or ContextMapper for each JavaBean class to build the mappings between JavaBean object and the LDAP entry. Step3: Design the DAO object for each JavaBean class to implement the CRUD operations. These operations call methods of Spring LdapTemplate against each mapped LDAP entry. There are the following challenges with this approach. You have to repeat Step2 for each JavaBean class to build the mappings in Java code. This is error-prone and time consuming. Moreover, whenever the JavaBean or LDAP entry is changed, you have to modify your mapping code as well. You have to repeat Step3 for each JavaBean class to build the DAO object and write code for all CRUD operations. Since the parent DAO may depend on the implementation of the children DAOs, the DAO implementation need to rewrite whenever the object hierarchy is changed. For example, the create() method in CompanyDAO need to call the create() of DepartmentDAO recursively to bind departments into LDAP. To overcome these challenges, I introduce an iBATIS-style XML Data Mapper. It can help you to design a better LDAP-persistence layer for your Java applications. This XML DataMapper decouples LDAP programming from Java application by moving data mapping logic from Java to XML Map file. With the step-by-step instruction, you will find that the simplicity is the biggest advantage of the XML Data Mapper. The XML Data Mapper framework will significantly reduce the amount of Java code that you normally need to call Spring-LDAP API. Provide a JavaBean object as a parameter. The parameter object will be used to set input values in a mapped LDAP operation (e.g. bind, search or modify, etc.). Execute the mapped LDAP operation. This step is where the magic happens. The Data Mapper framework will create an LdapMapClient instance, bind any parameters to the attributes of LDAP entry using the provided parameter object, execute the mapped LDAP operation, and build a result object from the Spring’s AttributeMap or ContextMap. 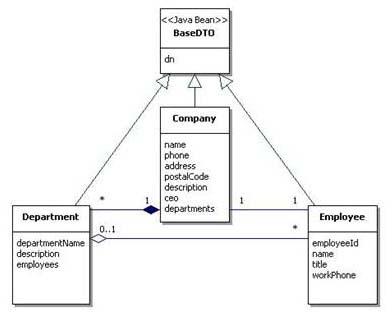 As shown in Figure3, the LDAP XML Data Mapper consists of two main components. Application Specific Artifacts: User-defined JavaBeans, Mapping XML, and LDAP property file. Data Mapper Engine: A set of Java Classes that parse the XML descriptors, bind the runtime input JavaBean object to the mapped LDAP operation, invoke Spring-LDAP API and return the result as a mapped JavaBean object. XML Data Mapper requires Spring-LDAP 1.2.1, Spring Framework 2.5.1 and J2SE 1.4. Setup Spring-LDAP following the instruction from the Spring LDAP home page. Download the java library(spring-ldap-xml-datamapper.jar) of XML Data Map Engine from the sample code of this article, and add to your classpath. A user-defined LDAP Map XML file is used to map JavaBean Object to LDAP entry and build mapped LDAP operations. Here is an example of a mapped operation to query all Employee objects under a Department’. The mapped LDAP ‘search’ operation is defined in a ‘search’ element. This operation has a unique ‘id’ as its identifier. The ‘parameterMapId’ specifies the input parameter JavaBean object for this operation. From this sample, it expects a ‘CommonSearchDTO’ object as its parameter JavaBean which has properties of ‘base’ and ‘scope’ that will be used to build a valid LDAP search call. The ‘resultMapId’ specifies the result JavaBean object of this operation. From this sample, it returns a List of ‘Employee’ JavaBean objects. The final step is to write java code to invoke the mapped LDAP operations. It is quite easy and simple. Following is the sample code snippet to list all employees of a specified department. There are only two lines of code to accomplish the invocation of a mapped LDAP ‘search’ operation. Invoke the factory method ‘buildLdapMapClient()’ to read the user-defined property file as input resource and build a LdapMapClient object. Call the ‘search()’ method of the LdapMapClient object to issue a search invocation to LDAP. It returns an ArrayList of ‘Employee’ JavaBean objects. There are two main steps to invoke a mapped LDAP operation. 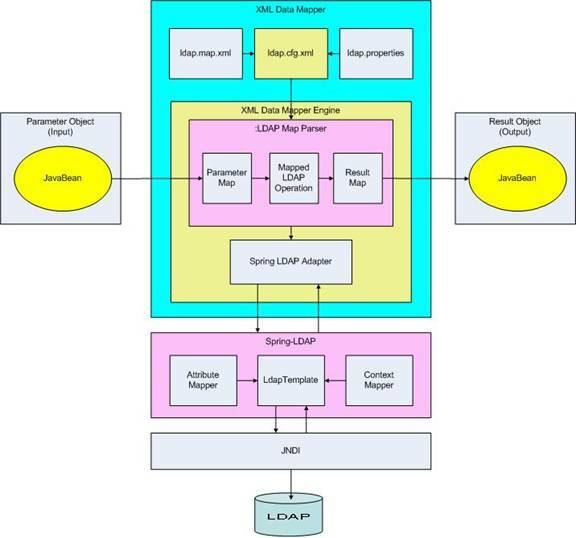 Data Mapper Initialization: the XML Data Mapper system is initialized by user-defined property file to initialize an LdapMapClient bean as illustrated in Figure 5. The factory method ‘buildLdapMapClient()’ reads user-defined property file, builds the Spring XML for bean wiring and calls Spring XmlBeanFactory to build ldapMapClient object. Spring XML bean factory generates an LdapMapClient bean instance. Initialize LdapMapClient by invoking its ’initializeResource()’ method: the user-defined map xml file (i.e. ldap.map.xml ) is parsed to build all mapped LDAP operations in HashMaps. Return LdapMapClient bean to user. Since the LdapMapClient parses the Map XML file, and binds the JavaBean object to the mapped LDAP operation at runtime, the Spring-LDAP’s AttributeMap or ContextMap are not need for each LDAP invocation. At this section, I will show you another main advantage of this XML Data Mapper: manipulate nested property element of your JavaBean as nested LDAP operations. From the samples of nested CRUD operations, you will see how to create, search, modify and delete a whole LDAP tree by simply manipulating your local JavaBean object. If you recall the data structure of the JavaBean object, the ‘krustyKrab’ company shown in Figure 1, you will find that it is not a simple JavaBean. It contains not only simple properties (such as name, phone, address, etc.) but also nested properties (such as an Employee object as ‘ceo’, and list of ‘Department’ objects as ‘departments’). With the nested-operation-mapping, you only need just two-line java code to create the whole sub-tree in LDAP. 1. Define the XML mapping file. The following is the sample mapping file for creating the whole LDAP sub tree. As shown in the sample Map XML file, ‘actionMap’ elements are defined in ‘parameterMap’ to support nested mapped LDAP operations. When you run this two-line java code, the whole sub-tree is created in LDAP. Similarly, using the nested nested-operation-mapping, you can read a whole LDAP sub-tree from LDAP to your complex JavaBean by a single java call. 1. Define the XML mapping file. From the sample Map XML file, you will see that the ‘actionMap’ elements are used in ‘resultMap’ to support nested mapped LDAP operations. 2. Write Java code to populate a ‘CompanySearch’ JavaBean object as the input parameter object for the nested search operation. You can also find the extensive sample code of other CRUD operations on your complex JavaBean. You can see the following benefits when using this XML Data Mapper. A Simple JavaBean/LDAP Entry Mapping Framework : It transplants O/RM concept to JNDI/LDAP environment. It can map not only simple JavaBean to single LDAP entry but also complex object to a whole LDAP sub-tree. The mapping is done at runtime by user-defined map xml file. Easy Coding : It provides a very simple Java API. Developer can easily manipulate their LDAP data through very simple and straight-forward java coding without knowing Spring-LDAP API. Enhanced Data Mapping : It supports nested LDAP operation, which can significantly reduce the code for manipulating the complex data in LDAP. Powerful : It leverages powerful features of Spring-LDAP, such as bean wiring, transaction support, context management and exception handling. Improved development flow: It relieves the tedious and error-prone java code from the developers. It makes the developers focus on the data model and business logic of the applications. By introducing the XML Map file, it decouples LDAP schema from Java application. This article introduces an iBATIS-style XML Data Mapper framework to extend Spring-LDAP. It simply uses O/RM concept to manipulate LDAP entries through JavaBean operations. From the example in the article, you can find that java code is significantly simplified by moving the mapping logic from java to XML. Moreover, the nested-operation-mapping allows user to manipulate complex data through an intuitive way. LDAP Programming, Management and Integration , by Clayton Donley , 2003 Manning Publications Co.
Colin (Chun) Lu is the systems analyst at Telus Mobility in Toronto, Canada. He has been working in Java/J2EE architecture design and development since 1999. Currently he is working in the area of SOA for Java EE application design and integration. You can reach Colin at .